This Top 5 has been compiled on demand since you - our readers - had the opportunity to express yourself and choose the Top5 category that you find the most interesting. And this time, it's the age that matters for this category is titles Top 5 Oldest Bookstores on the Continent. The good news is, that after some lengthy discussions we came to the conclusion that the best solution is to divide this Oldest Bookstores category into two. Namely, in one we'll focus solely on continental bookstores, while the other will consist of oldest UK bookstores in a separate Top5. And the reason? Simply because UK bookstores (logically) have a comparative age advantage over the continental ones when it comes to having a stock of books in English. 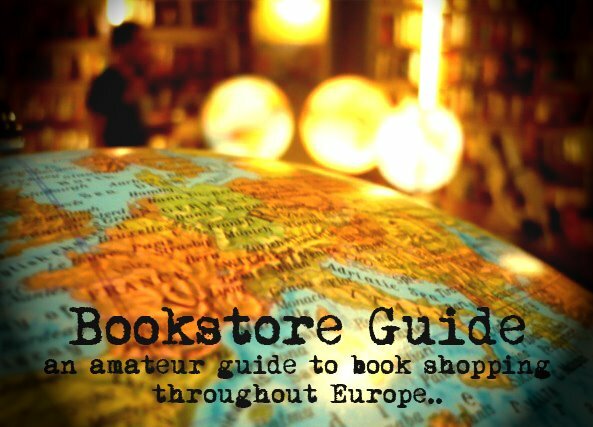 Therefore, without further ado, we are taking you to continental Europe where we've been searching for the bookstores with the longest presence. Important Update: Thanks to your feedback regarding this Top 5, you can check out more of the continent's oldest bookstores that some of our readers recommended after reading our original text - just follow the link to Additional Reader's Picks. There were no doubts whatsoever about the number 1 of this category, as Galignani is the only continental English bookstore which could compete with its UK counterparts in terms of age. The following few paragraphs attempt to briefly wrap up the fascinating history of the name Galignani and its involvement in the book business. The bond between the Galignani family and books dates all the way back to early 16th century, as they belong among the first users of Gutenberg's major invention - the mechanical printing press. The Galignani tradition was started off by Simone Galignani, based in Venice, in those days still one of the main centers of the international trade, in 1520. The greatest success of the Galignani publishing efforts came with Ptolemy's Geographia, which they published in 1597 and which went on to become a major bestseller throughout the 16th and 17th century. As Venice went through a rather complicated period in the following few centuries and its fame and economical power were fading out, Giovanni Antonio Galignani decided to leave the city at the end of the 17th century and after a short stop in London (due to the dramatic situation in Paris during the decade following the French Revolution of 1789), he went on to settle in Paris, where he opened the Galignani bookstore in 1801. The bust of the founder still proudly stands near the entrance of the bookstore. The original Galignani bookshop on rue Vivienne also housed the publishing business of the family and most importantly, it also had a conversation room and a reading room specialized in English language. Talk about providing services for expats - in 1814, the Galignanis started publishing a daily newspaper the "Galignani's Messenger" aimed specifically at the English-speaking community in Paris and all of France, with contributors like Wordsworth, Thackeray or Byron. 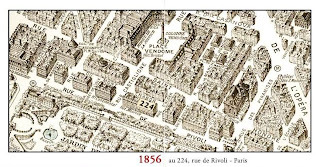 In 1856 the bookstore has moved to its current location, under the arcade at rue de Rivoli, halfway between the famous Musée du Louvre and La Place de la Concorde. The beginning of the 20th century marked the end of their publishing activities, which also meant the end of "Galignani's Messenger". During World War I, the bookstore provided books for British and later on for American soldiers in Paris. A true test of endurance came with the German occupation of Paris during World War II. English books were banned and the owner at that time, André Jeancourt-Galignani, was thus forced to invent a new special feature of the bookstore, which he did by adding a fine arts department. Galignani also started selling books in French, but right after the war, it went straight back to restoring its main pride - the English section. However French titles and the mentioned art section remained as a permanent feature of the bookstore. All in all, since 1801, this means six generations of Galignanis in charge of the bookstore over more than two centuries of its existence. The bookstore has most deservedly built an excellent reputation and the list of its famous customers would be too long so we'll just mention Ernest Hemingway, André Malraux, Orson Welles or Marlene Dietrich. The added value of Galignani is that as the oldest English language bookshop on the continent it has managed to secure its independent status, and luckily, it doesn't seem that this fact should change any time soon. The story of Eleftheroudakis is a story over a century old, a story full of tradition and undisputed love for books. It begins in 1898, over a hundred years ago, when a book lover by the name of Costas Eleftheroudakis formed a partnership with a company from Bavaria, only to become an independent bookstore owner just a few years later. He named his bookstore 'Eleftheroudakis International Bookstore'. Costas Eleftheroudakis, being a scholar and bibliophile that he was, had made the essential steps for establishing the bookstore as it is today. He also entered the world of publishing in the 1910s, printing books, travel guides, maps and even postcards and just over a decade later, he published a 24 volume Eleftheroudakis Encyclopaedia. During the next decades of the 20th century, the bookstore remains in the Eleftheroudakis family, only changing the premises of their main offices from Syntagma Square to Nikis Street. By the 1980s, the bookstore was already spread on several locations in Athens and in 1989, sisters Sofika and Marina Eleftheroudakis became the owners and still are to this very day. With the help of innovative technology and marketing, they've been modernizing the bookstore to meet the demands of the 21st century. 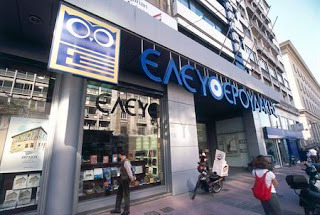 They also opened the biggest bookstore in Athens in 1995 - Eleftheroudakis at Panepistimiou Street nr. 17. It is a megastore, spreading on 8 floors (you can take a virtual tour of the bookstore by clicking HERE). What stands out in Eleftheroudakis is that despite of it being the most popular bookstore chain in Greece (it spreads on over 20 locations in Athens only, but there are also branches in other cities in Greece), it has managed to remain in the hands of the Eleftheroudakis family - a family which has always put the needs of their customers above their own. The real history behind Lello goes all the way back to the second half of the 19th century when one bookstore has passed through various hands and changed its name several times in order to finally reach José de Sousa Lello in 1894 when the bookstore was named Livraria Chardron De Lello & Irmão (irmão meaning 'brother', due to the fact that Jose co-owned the bookstore with his brother António). The first premises of the bookstore could be found at 18/20 Almada Street, Oporto - only to be relocated to its current location in Carmelitas Street in 1906 - this being the official year of the bookstore's opening as its inauguration took place on January the 13th, 1906. 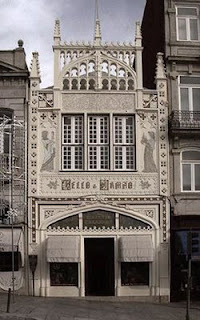 The difficult task of building a place strictly for the purpose of the bookstore was given to Francisco Xavier Esteves, a distinguished Portuguese architect and engineer at the time. The style of the building is neo-gothic and is indeed a true monument known all around the world (for more details on the actual facade and interior of the bookstore, check out the original post and Top5:Impressive Appearance post on Livraria Lello). 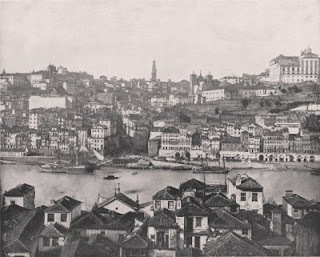 The inauguration itself was a sensation among Oporto's inhabitants. Many famous people (public figures, professors, journalists, etc.) accompanied by the press came to witness the event. The news were heard all the way to Brazil. A hundred years later, Livraria Lello (also known as Livraria Chardron - which is, indeed, its official name but it's more known as Lello) still stands where it has in 1906. It has gone through many refurbishments, restorations and updates needed to keep it up to date with the needs of a modern man, but still it managed to retain its uniqueness and originality. Dom Knigi (House of Books) opened its door on December 19th 1919 in the former building of the Singer (Zinger) company. 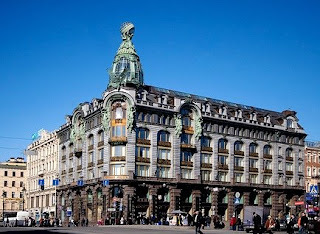 It occupied all seven floors of this beautiful corner tower with a glass sphere.The first manager of Dom Knigi was N.I. Kurochkin who was later succeeded by Alexander Ivanovich Anikeev, who remained on the post for 10 years. Near the end of the 1920s, this Soviet bookstore went through many changes, which cost it its independance, but also added to its further development. 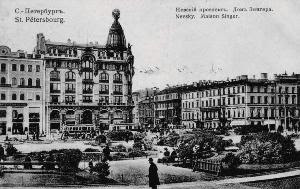 In 1924, the city changed its name from Petrograd to Leningrad and thus the bookstore ended up in the jurisdiction of Lenkogiz or Lengiz (it was the Leningrad branch of the state publishing house). Once the communists took full control of the country and started implementing their economical plans, it also meant putting all the publishing houses under state control, and Dom Knigi was the first one to be added under Lengiz. During that period, many famous people frequently visited the bookstore. Among these were the writers Alexey Nikolayevich Tolstoy, Olga Forsh and Samuil Marshak – famous authors of the time. Reportedly, Alexander Vvedensky, a notable Russian poet and a legendary figure of Leningrad, made love to a woman (or women) in the glass dome of the famous Singer Building. However, this story remains a legend to this very day. At the time of the Second World War, Dom Knigi carried on working, even some time during the occupation of Leningrad (the siege lasted 872 days). Lots of people who worked at Dom Knigi went on to the front. The bookstore, selling books that propagated the flaws of the fascist regime and inspired the Russian people, was forcibly closed in November 1942 due to the shortage of electrical energy. After the war, Dom Knigi reopened on November 14th 1948 and from then on, they became the pioneers of book advertising, securing their position by attracting visitors through inventive strategies – and it has established itself as one of Russia’s leading bookstores and has remained as such ever since. 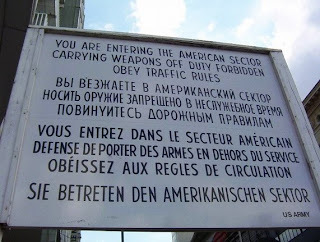 Until the collapse of the communist regime, the offer of English books was quite limited, due to the tense relations between the Soviet Union and the United States, the two superpowers of the Cold War era. However, a certain amount of books (approved by the Soviet regime, mostly those critical of the American society) still appeared on the shelves of this bookstore in their original English language. Of course, the situation has changed significantly in the 1990s and English books are now a stable part of the stock at Dom Knigi. 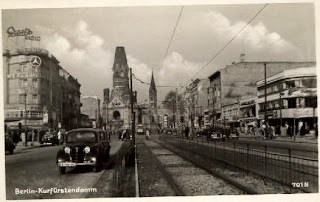 Another interesting fact about Dom Knigi is that it has witnessed several changes of the name of the city (it was first located in Petrograd (until 1924) which changed the name to Leningrad, only to change it again to Sankt Petersburg in 1991). The number 5 on our list comes from the capital of Germany - Berlin, and it belongs to one of the city's best established bookstores - Marga Schoeller Bücherstube. This bookstore has been a part of the everyday life of the people of Berlin for quite some time, and it has also witnessed all the major historical events the city of Berlin has gone through in the past 80 years. 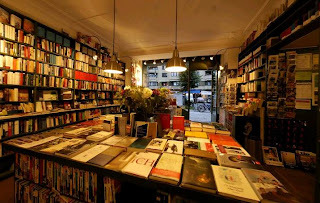 The whole story of this famous bookstore starts of in 1929, when its legendary founder Marga Schoeller, aged 24 at that time, opens the Marga Schoeller Bücherstube in Kurfürstendamm in Berlin. The first tough test for the bookstore came in the following decade, which was marked by the rise to power of Adolf Hitler and his Nazi party in Germany. During this period, Marga Schoeller kept the forbidden literature, banned by the Nazi regime of the Third Reich for ideological reasons, hidden in the basement and available to trustworthy customers. She also bravely resisted the ideological policies of the Nazi regime and refused to sell propagandist literature. After the allies conquered Berlin, this bookstore was one of the first to receive the license to continue its business, along with the permission to sell English books. From then on, a well-stocked English section has been one of the main features of the bookstore and also its biggest pride. The bookstore was subsequently enlarged and it has become the main meeting point of intellectuals and artists in West Berlin. The names on the list of its prominent literary visitors include Bertold Brecht, Elias Canetti, Hermann Hesse, T. S. Eliot, Thornton Wilder, Thomas Mann and Erich Kästner. At one point in its history, the quality of the bookstore was fully recognized by its addition to the list of Europe's 10 best bookstores. In 1974 the bookstore has relocated to Knesebeckstrasse, only a few streets further from its original place. After the collapse of the Soviet empire and the dismantling of the Berlin wall which has been separating the city for 28 years, the bookstore has lived to see the reunion of Berlin in 1989. The founder, Marga Schoeller, passed away in 1978, but her son along with the bookstores employees decided to carry on the tradition and so the bookstore still stands and maintains its original principles. We tried our best to introduce you to the stories behind five different bookstores in five different cities on the continent. What links them together is the respect for tradition and the ability to last no matter how unfavorable the conditions may be. Although this sounds quite simple, in reality it's a lot more difficult. In Krakow, Poland, in 1610 a book shop was open and still runing!!!!!! Is located in street "Rynek 23"
Well I think you missed one very important, also in Portugal, but in Lisbon. As recorded in "The Guiness Book of Records" the Bertrand Bookstore at Chiado is the oldest one, established in 1732. The World's Oldest Bookstore in the World in indeed in Lisboa - Portugal. Located in the iconic Chiado district (73-75 Rua Garret) in Lisboa! Founded in 1732 by Pedro Faure, Bertrand has been a truly literary club over the years and a place of exclusive tertulia, ie, literary gatherings of the most renowned Portuguese writers, poets, philosophers, intellectuals and politicians (such as Alexandre Herculano, Oliveira Martins, Eca de Queiros, Antero de Quental, Ramalho Ortigao, Aquilino Ribeiro, Fernando Namora, Jose Cardoso Pires) and even royalty (including the late King and Emperor Dom Pedro II himself, known for defending freedom of speech and the abolition of slavery). 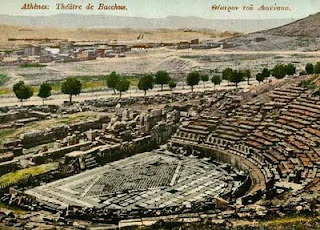 With a reputation of attracting high-profile authors, Bertrand continues to organise traditional tertulias, as well as book signings, book launches and cultural debates. It is a must in any cultural travel agenda! All bigger bookstores in Germany have a section with English books and 'Korn und Berg' have listed over 100,000, at least online. Also - do you think that Bertrand in Lisboa started of with English books in 1732? Who do you think spoke English back than? Even the Moravian bookstore in Pennsylvania in the US probably started 1745 as a Czech or German bookstore, because they immigrated from Germany. Bertrand, in Lisbon, oldest bookshop in the world still operating. 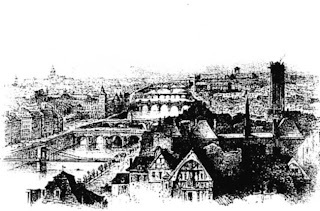 1732. And Llibreria Roca in Manresa, Catalonia, Spain, is open without interruptions since 1824. Llibreria Viladrich in Tortosa, Catalonia, Spain opened in 1760; in 2005 the owners (the same family that founded it) sold the business and it is today continued by some of the old booksellers, but in other store with the same name; it is, actually, the continuation of the old bookshop in other place.